MnGeo and the Minnesota Department of Natural Resources assessed better ways to provide LiDAR-derived data and information online to the public. A short online survey helped us understand what formats and delivery options were most needed. 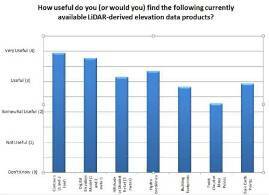 This survey, which closed May 14, 2012, complemented one conducted the previous spring that assessed LiDAR training needs. 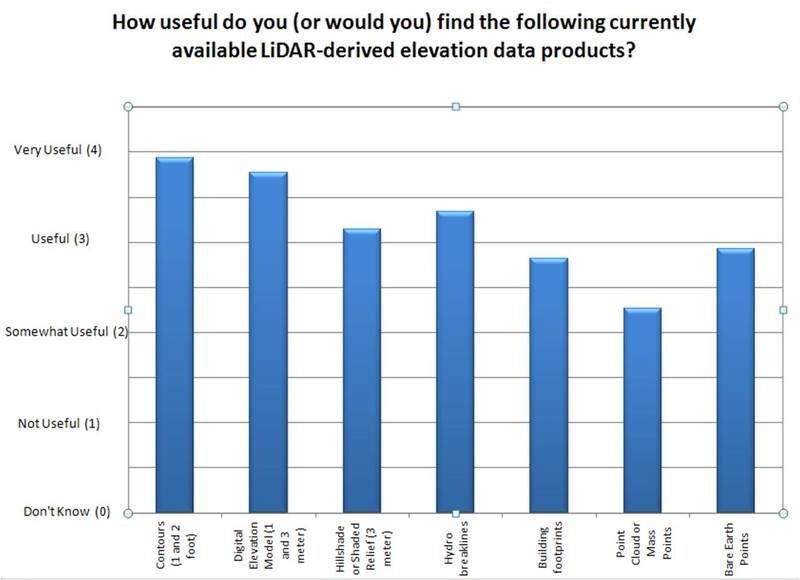 Related survey on LiDAR training needs done Spring 2011 -- click here for the results. A remote sensing technology that can measure the distance to a target by illuminating the target with light, using pulses from a laser. The data points collected by a LiDAR sensor can be converted into a variety of data products -- e.g., elevation models, contours, hillshade models -- to accurately describe the topography of the earth and the features on it. Polygons that show the outlines of buildings at ground level. Imaginary lines on the ground, all points of which are at the same elevation. LiDAR-derived contours for Minnesota are being created at 1 and 2 foot intervals. A model of the bare earth surface that has regularly spaced horizontal grid cells, each with an elevation value. DEMs for Minnesota are being created with 1 and 3 meter grid cells. Grid cell (raster) data where values have been assigned to grid cells to mimic the sun's shining on the terrain so that it's easier to see surface relief. Hillshades for Minnesota are being created with 3 meter resolution. A breakline is a line showing a significant change in the smoothness of a surface such as an abrupt elevation change. A hydro breakline shows a stream or lake shoreline. Points collected by a LiDAR sensor that show the elevation of the surface of the ground and of objects on the ground. Point cloud data can be classified into categories (e.g., bare earth, vegetation, and buildings). Proprietary format used with Intergraph’s IMAGINE software for analyzing imagery. Proprietary format for data storage used with Esri's ArcGIS and ArcInfo software. A geodatabase represents geographic features and attributes as objects and is hosted inside a relational database management system. Esri's proprietary format for raster (grid cell) data storage. A grid is composed of equally sized square cells arranged in rows and columns where each cell contains a value for the feature it covers. A georeferenced TIFF-format image file. A version of XML used with Google Earth. KML displays geographic data on Google Earth maps and globes. A non-proprietary file format used to exchange LiDAR point data. Minnesota's LAS points are classified into categories (e.g., bare ground, vegetation, and buildings). A standard way to provide georeferenced map images over the Internet. WMS is useful for people who just want to view the data, since the images are read-only and cannot be spatially analyzed. Both raster and vector data can be converted into WMS images. A standard way to provide georeferenced raster grid cells over the Internet. WCS is useful for people who need content from raster elevation data since coverages may be edited and spatially analyzed. DEMs and slope grids are examples of raster data that can be delivered using WCS. A standard way to provide georeferenced vector data (points, lines, and polygons) over the Internet. WFS is useful for people who need content from vector elevation data, not just images of the data since WFS may be edited and spatially analyzed. Contour lines, breaklines and point clouds are examples of vector data that can be delivered using WFS. Visual appeal of a web application. Usefulness of the information displayed by a web application. Capabilities of an application seen as the sum of its features. Effectiveness, efficiency, and satisfaction with which users can accomplish their tasks with the web application.